I realised last night I'd done the above Wieden + Kennedy themed weekly shop this week. I've been buying Yakult for a while now as I mentioned here before. I've also started getting Lurpak as I liked these ads a lot. Then when I was reading the W+K blog on Friday night I saw this ad they did for the Guardian weekend supplement on British beaches and thought I'd get that aswell. 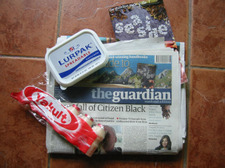 Forming this nice little package of W+K FMCG shopping. I was even thinking about getting some Cravendale but I'm off on holiday on Wednesday and can't get through a litre in that time. Effectiveness in action! Makes me wonder if we should be encouraging our clients to get together and do joint campaigns. By the way, the Cravendale filtration process means it also lasts longer than ordinary milk. So it might keep till you get back. To return the favour, you can be happy in the knowledge I've downed at least a couple of litres of Innocent products this weekend. I'm partial to the (new improved) coconut and pineapple. I'll give the Cravendale a go when I get back from my holiday. And keep saving for that Honda. budgie man I just saw The Budgie Man outside the Tate Modern. If you're ever on the SouthBank on a Saturday be sure to give him a look in. He's better than most of the stuff inside the Tate. tribal youth This is a very interesting little presentation by Albion on Skype. Also slidehsare is a good little app to add power points into blogs and stuff. The Impossible Quiz Answers: Very interesting, thanks! On all you need is..